I was in a Mexican bakery in Los Angeles the other day, and wondered what the big round cake was. 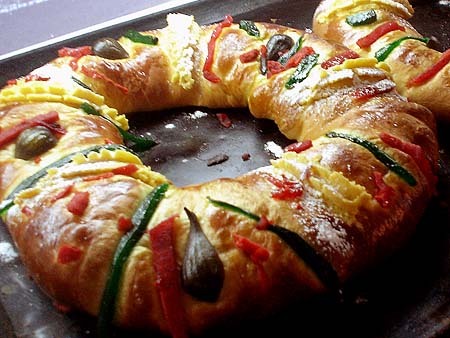 It was a Rosca de los Reyes, the traditional cake to celebrate Epiphany on January 6th. According to tradition, that’s the day the 3 wise men arrived in Bethlehem. Roscón de reyes or rosca de reyes (kings’ ring) is a Spanish and Latin American king’s cake pastry traditionally eaten to celebrate Epiphany. 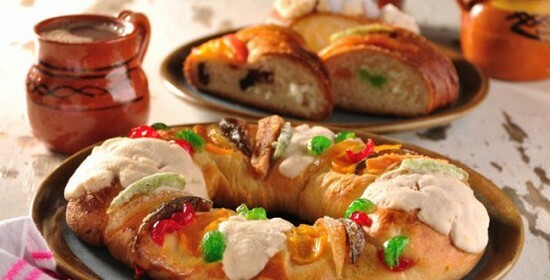 Although the name indicates that it should be round, the “rosca de reyes” generally has an oval shape due to the need to make cakes larger than 30 cm across for larger parties. Recipes vary from country to country. For decoration, fig fruit, quinces, cherries or dried and candied fruits are used. The tradition of placing a trinket (figurine of the Christ Child) in the cake is very old. The baby Jesus hidden in the bread represents the flight of the Holy Family, fleeing from King Herod’s evil plan to kill all babies that could be the prophesied messiah. Whoever finds the baby Jesus figurine is blessed and must take the figurine to the nearest church on February 2, Candlemas Day (Día de la Candelaria). In the Mexican culture, this person also has to throw a party and provide tamales and atole to the guests. In US communities with large Mexican and Mexican-American populations such as Los Angeles, San Jose, and Chicago, the celebration includes the Mexican hominy stew pozole, which is made for all one’s neighbors. In Spain, roscones bought in pastry shops have a small figure hidden inside, either of a baby Jesus or little toys for children, as well as the more traditional dry fava bean. Whoever finds the figure is crowned “king” or “queen” of the celebration, whereas whoever finds the bean has to pay for the next year’s roscón or Epiphany party. n Argentina, there is a similar tradition of eating the rosca on January 6, although no figurine is included. A similar version of the pastry with whole eggs baked on top is served on Easter as rosca de Pascua. In some places, the roscón de reyes is replaced by panettone, also baked with trinkets inside. In France, a similar pastry known as a galette de rois (made with puff pastry and almond cream) is eaten on Epiphany, and in the US, the formerly French/Spanish city of New Orleans LA continues this tradition later in the year with their Kings’ Cake, a rich yeasted bread decorated with colored sugar and eaten before Mardi Gras. This entry was posted in Food!, Stories and Observations and tagged Día de los reyes, Epiphany, Mexican cuisine, Mexican Culture, rosca de los reyes by brucecritchley. Bookmark the permalink. A delicious treat of the season!